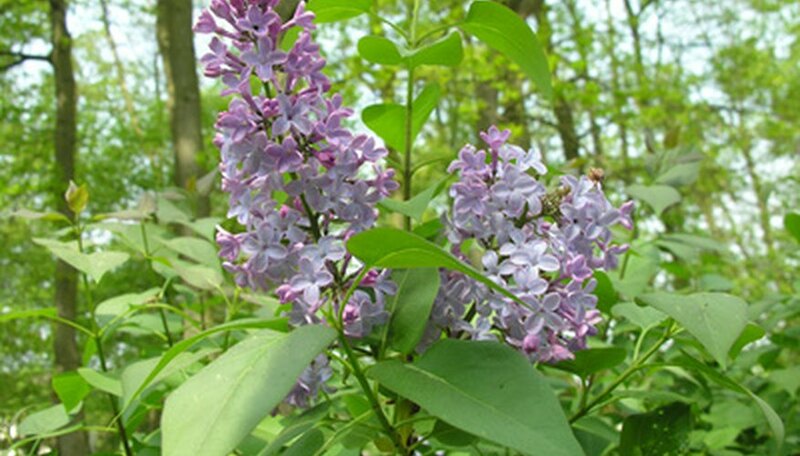 Lilac bushes are available in a wide variety of species with an array of potential problems. Commonly affected by fungal infections that cause mold, keeping your plant vigorous, choosing resistant varieties and understanding how to manage mold problems is key to keeping healthy lilac bushes. Implement as many preventive measures as you can so if control is necessary, your plant may bounce back to health. A variety of fungal strains attack lilac bushes and, along with damage to plants, these strains create an infection that causes mold. Plants in decline, stressed bushes and wounded lilac are much more susceptible to infection because fungi usually enter through cuts in plant tissue; unhealthy plants are less capable of fighting infection than vigorous lilac bushes. To keep your plants healthy, keep lilac bushes in full sunlight and moist, well-drained soil. Plant lilac in USDA Hardiness Zones 3 to 7. Fungi cause mold on lilac bushes. Understanding where the problem is coming from allows you to choose the appropriate mold treatment. Gray mold is an indiscriminate fungal infection that attacks any type of host plant, including lilac bushes. Gray mold is caused by the fungus Botrytis cinerea as well as other fungi. Additionally, caused by a wide variety of fungal strains, powdery mildew is a disease affecting lilac bushes as well as other woody plants. Different fungal infections of lilac bushes often cause symptoms that include mold. Gray mold, for instance, infects both healthy and sick plant tissues by inhabiting dead plant parts and spreading into other areas of the plant. Particularly in instances of excessive moisture, a web-like cover of gray mold forms on plant surfaces. This may lead to plant decline. Powdery mildew attacks lilac bushes, as well, displaying what resembles white patches of mold or mildew on all parts of the bush. Though the plant may remain substantially unaffected, mold may cause severe problems and, ultimately, decline of the lilac bush. Certain lilac bushes are more resistant to mold than others. Choosing resistant varieties greatly increases the potential successful of your lilacs. For example, powdery mildew resistant cultivars of the common lilac species Syringa vulgaris include "Madame Lemoine," a white lilac; "Charles Joly," a magenta-hued lilac; "President Lincoln," a blue lilac; and 'Primrose', a cream/yellow lilac. Keep plants well-maintained and vigorous. Keep plants out of excessive shade or moisture, as these are breeding grounds for fungi. Always collect and destroy infected plant parts to prevent spread of disease. For powdery mildew, chemical control is not recommended. For other mold problems such as gray mold, pay attention to sanitation; always clean pruning tools between each cut and before use on another plant to prevent disease spread. Determine what type of mold is affecting the lilac; consult a professional or county extension agent for assistance. Apply the appropriate fungicide to control severe infections and follow treatment as directed. Fungicides generally need to be applied to the entire lilac bush and may need to be applied in more than one treatment for full effectiveness.